This month's Horse & Rider Gallop Poll is whether or not you would loan your horse out for youth competition - specifically for things like the Youth World Cup and college Equestrian Team events. My answer, based on personal experience, would certainly be yes. I loaned out on of my horses last year to a girl in my 4-H club, and she's using that horse again this year, and now I've loaned out another one. Both horses still live at my house and I provide all their care and feed, but the girls come ride, reimburse me for any special expenses I wouldn't otherwise incur, and do a lot of the barn work for me (this in itself makes it worthwhile!). But the biggest benefit I see is the satisfaction in knowing that I am helping a child who wouldn't otherwise have the opportunities I had as a youth. I consider myself to have been very blessed to grow up with plenty of horses in my backyard and parents who were willing, and capable, of allowing me to pursue this very expensive hobby. The impact that horses had on my life is greater than even I will probably ever realize. Another bonus is seeing my horses succeed, even though I'm not the one doing it with them. Case in point, last summer at the 4-H fair when Harmony carried her rider to a 1st place finish in Western Pleasure. She didn't become a show horse until that summer, at 15 years of age. I always new she had potential, because she is a very sweet and smooth natural mover, but my husband had had her since she was a yearling, and all he was interested in was "cowboying." But when Harmony gave a beautiful ride in that class, and deservedly took the blue, I almost cried with pride. I don't know why - I'd only ridden her myself just a few times, I certainly couldn't take credit for training her, and I hadn't given her rider any more time that I had given to any other girl in the 4-H club. But that was my horse, and I was proud of her achievements. 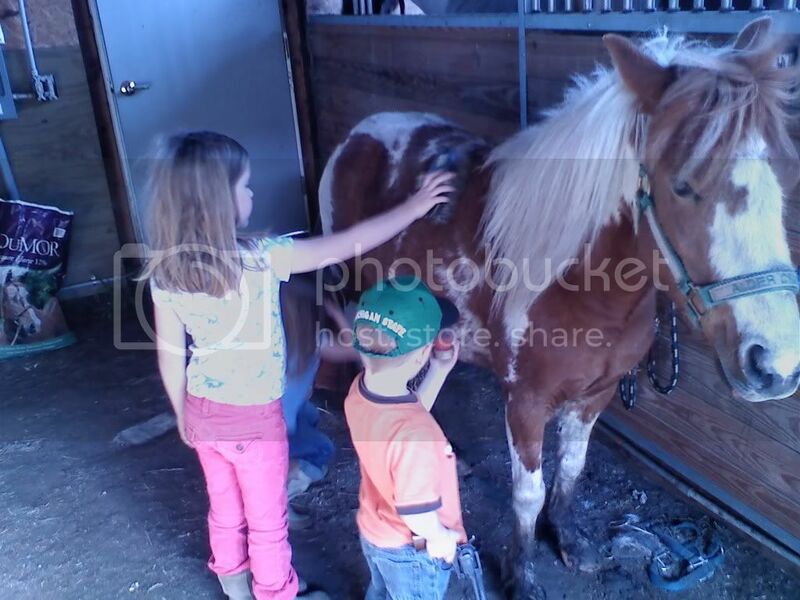 Here's an example of getting those kids doing my "dirty work" for me - they don't mind getting covered in horse hair during shedding season, and six hands, even little ones, make pretty quick work of it. Congrats on the Success of the Kids and Your Beautiful Babies.